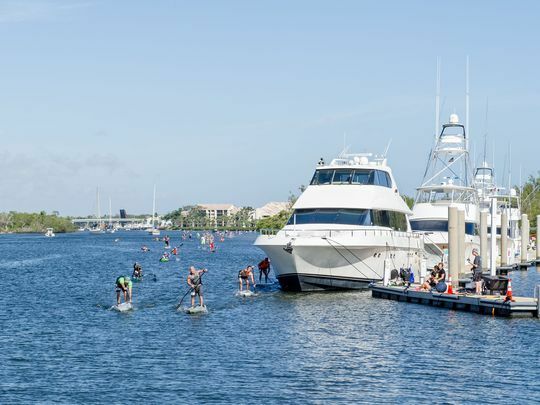 Record crowds attended the 3rd Annual Palm Beach County Paddlefest, hosted by Marine Industries Association of Palm Beach County at Harbourside Place on Feb. 10. 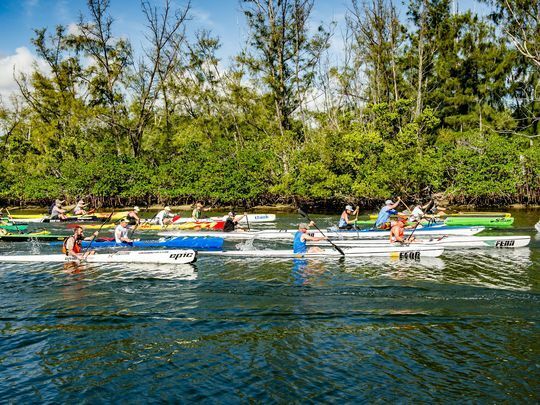 What began as a small race several years ago, at Currie Park in West Palm Beach, has morphed into a highly competitive race drawing competitors and visitors from throughout Florida. 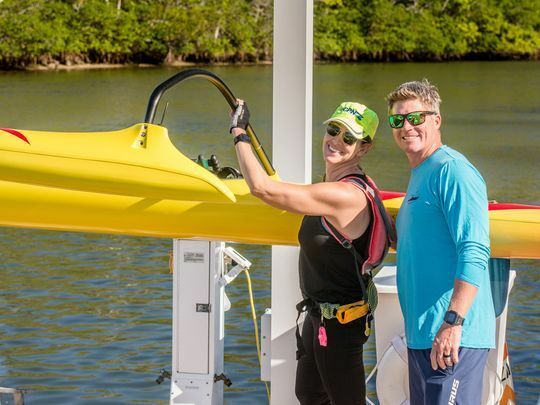 Marine Industries Association operations director Alyssa Freeman said, “We decided to work with Paddleguru and make the race more official with timing chips, race categories for boards and kayaks, etc. “We had about 50 racers last year and close to 50 vendors, and sold out of vendor space!” she said. “The first two years, the event took place in May – and we made the decision to change it to February to attract more racers. And boy, did that work. We had well over 100 racers this year! Taking home top honors in the Mens 5 mile race with a finishing time of 00:55:15:11, Steve Miller began racing four year ago at Blueline Surf and Paddle’s Tuesday Night Race League and was immediately hooked. 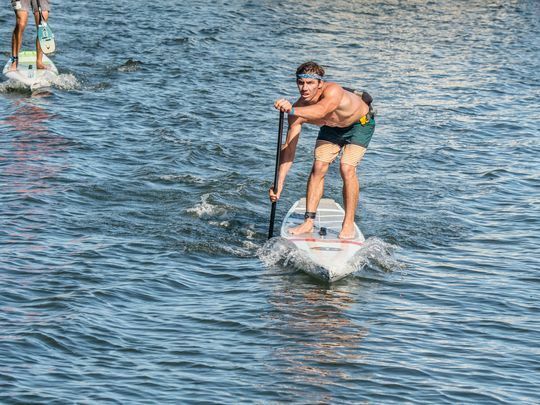 Miller loves to compete, but said he also paddles for the exercise and loves being part of the strong paddle community in this area. 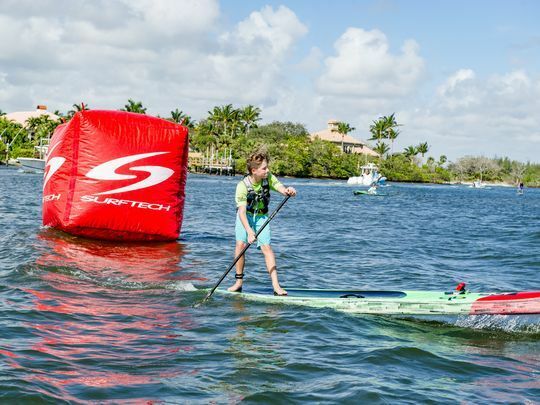 “Having the Palm Beach Paddlefest right in our backyard is a blast and seeing so many paddlers young and old is great,” he said. “The course this year was perfect for this venue. It was 5 miles and 2 1/2 laps around two islands in a figure eight. I always like lap courses because it’s spectator friendly and they get to see the race happen. “It also energizes all the racers as they come by and hear the cheers from family and friends. We need more races just like this in great venues and also on the beach going in and out of the surf,” he said. Rachel Ferguson-Chase finished second in the 5 mile Women’s race on a 14-foot board, with a finishing time of 01:10:25.97. A little over one minute separated her from first place finisher Elizabeth Miller with a time of 1:09:23.14. Ferguson-Chase began racing four and one-half years ago when she started dating her now husband Stephen Chase. “We did it for exercise and fun. Over the years, we have become part of an amazing community,” she said. 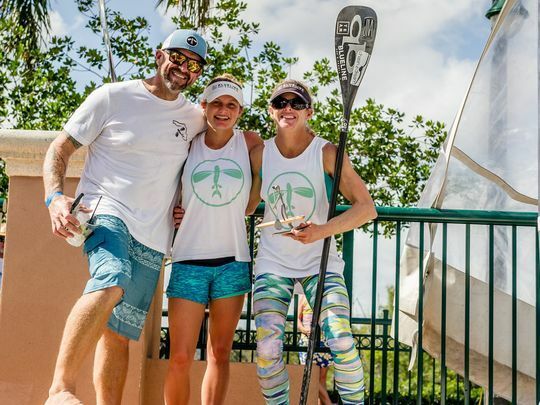 “Palm Beach Paddlefest was a fun and well-run race again this year,” she said. “They changed up the course, which made for a welcomed change. We made more passes by Harbourside Place and the spectators were able to be more involved. Allen began racing about five years ago. “One of my surfing buddies mentioned that I should compete in Blueline’s Summer Race Series because there were not a lot of girls competing and I might win something,” she said. 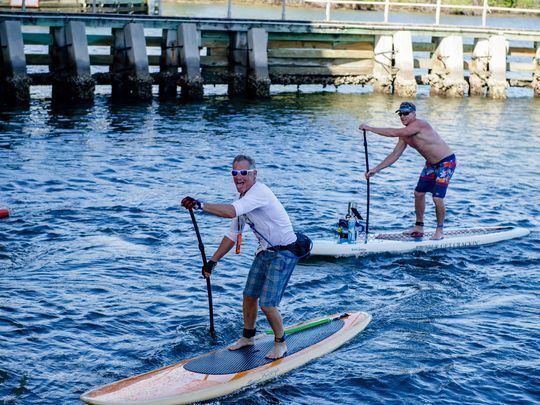 “This is true; by competing leisurely, I won: a paddle, a book, so many shirts, stickers, hats, koozies, keychains, trophies, some money and a few local sponsorships. This was my first time attending an event hosted by Harbourside Place, and I thought it was well-organized. “I think more time should be allotted for the awards ceremony, but otherwise, everything ran smoothly and relatively on time,” she said. “As a Blueline instructor and guide, these waterways are my home,” according to Allen. 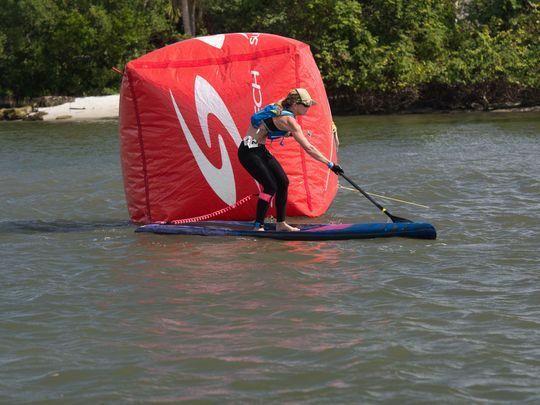 “The guys at Blueline Surf and Paddle spent a lot of time working on this course – and I think they did a great job! 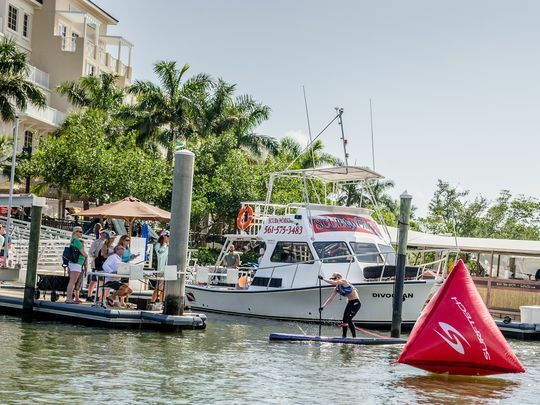 Complete race results can be found at http://www.palmbeachpaddlefest.com/races/.